There are many ways that people can injure their shoulders. There are also many types of shoulder injuries. There are bones, tendons, ligaments, cartilage, and muscles in the shoulder. These can all be injured. Cut - Superficial: Superficial cuts (scratches) only part of the way through the skin and rarely become infected. A scratch is an injury to the skin made by a sharp edge. For example, scratches can be caused by fingernails, a sharp nail, a piece of metal, or a branch of a tree or bush. A paper cut is a scratch from the edge of a piece of paper. This can usually be treated at home. Making certain the wound is clean is the most important thing. Dislocation: This is when a bone comes out of the joint. The joint always looks crooked or deformed. The pain is severe. 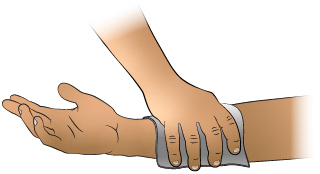 A person with a shoulder dislocation will not be able to use the arm at all. A doctor will treat this by putting the bone back into the joint socket. Fracture: This is the medical term for a broken bone. It means the same thing as a break or crack in the bone. The pain is severe. 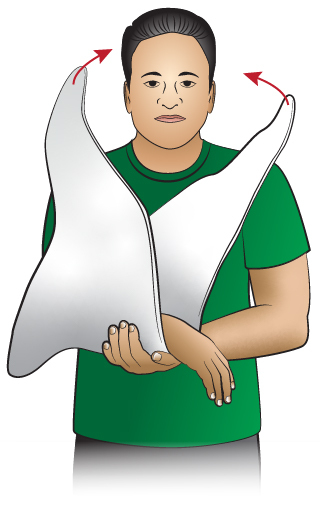 A person with a shoulder fracture usually cannot use the arm because of pain. 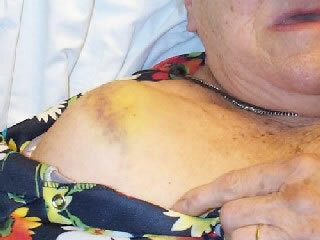 Minor fractures can be treated with a sling. More severe fractures require surgery. Fracture - Clavicle: The more common name for the clavicle is the collarbone. There is one on each side of the upper chest. It is about the length of a pencil. This a very common fracture, especially in younger adults. In most cases the only treatment needed is a sling or a clavicle strap. Strain: A strain is the medical term used when muscles are torn or over-stretched. A more common term for this is a "pulled muscle." These are common injuries from falling, heavy lifting, and sports. Strains may heal themselves with time and rest. Surgery is rarely needed for a muscle strain. If pain lasts more than 2 days, apply heat to the sore area. Use a heat pack, heating pad or warm wet washcloth. Do this for 10 minutes, then as needed. 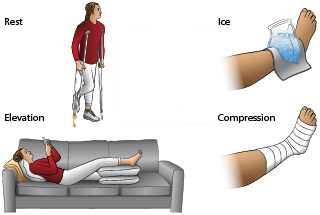 Rest the injured area as much as possible for 48 hours. REST the injured shoulder for 24 hours. You can then return to normal activities if it is not too painful.